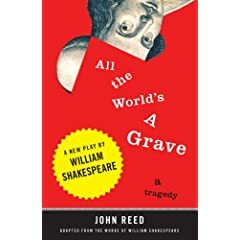 In All the World's a Grave: A New Play by William Shakespeare, John Reed takes the lines and characters from Shakespeare's plays and has created a new, exciting and often funny story starring familiar icons like Macbeth, Hamlet, King Lear and others. Reed has brought music's remix culture to literature with stunning results. Emily Wells: "Fair Thee Well Requiem Mix"
It's tempting to put this whole album on here. The Symphonies: Dreams, Memories & Parties. My relation to the album is tenuous: I heard a clip of it on WFUV, which I was listening to because I had recently been on WFUV discussing my new book, All the World's a Grave: A New Play by William Shakespeare, and I had left the channel on that station, and I don't listen to the radio often enough to know the difference between stations, or to change them for any reason outside of: "whatever this is on the radio, it annoys me." I had thought the clip sounded interesting, vaguely 80s New York—East Village, Hell's Kitchen, etc.—and I've been thinking about that period, in relation to Grave, and I have another project that occasionally comes to life that's set then. The project has been optioned, on again off again, and has made me a little dough; but it requires a composer, and has a bit of a composer curse on it. I'm not sure that one composer could do it—but anyway, Wells matches up nicely, and I was vaguely thinking she could be good. Completely crazy of me, of course, I can't imagine what incentive I could offer her to work on the thing. But anyway, fantasies know no anchors, and I have this fantasy. Was thinking about Anderson, in relation to the Wells—the violin and distortion, to start with—when the subject came up over lunch with Nina Wiener. Through many years of my childhood—maybe seven years?—I lived with Nina in a Tribeca loft (the lofts then were pretty raw). Nina's 1982 dance piece, "Time to Go," which was performed at BAM (Brooklyn Academy of Music), was set to Anderson's "Lullabies for Elisabeth." The "No Wave" band practiced over my head, in the loft above our loft, so it's hard to forget them. I remember lying on my bed (a mattress balanced on paint cans), watching the floor bump with the bass drum. I was maybe five. There were two pieces about the "No Wave" moment in the New York Times on June 12, when I was in the throes of Grave (in production, and soon to be released). The poignancy of the coverage was deeply felt by the old downtowners. Nancy Arlen, Mars's drummer and sometimes vocalist, was printed in a large photo in the front of the Arts Section. She'd been dead for two years. Sumner Crane, the vocalist, had been dead since 2003. Last I'd talked to Nancy, she was tending bar at Puffy's—the old Tribeca mainstay. At one time, I'd also shared a loft with her and her daughter, who I miss like a lost sibling. Rumble Fish, the Francis Ford Coppola film based on the S.E. Hinton novel of the same name, captured the end of that era the moment it ended—largely thanks to the Copeland soundtrack. Philip Glass: "Einstein on the Beach"
Saw this at BAM when I was a teenager. Went to school with Glass's children, as well as Lee Breuer's children. I'd seen tapes of the projects that Glass and Breuer had worked on together: the B-Beaver Animation, and the Red Horse Animation. Einstein on the Beach was directed by Robert Wilson, whose opera adaptations were already in my thoughts when a gifted former student of mine took a job working for him—in around 2007. These productions milled through my head as I initially embarked on Grave. Foremost: The Cave, by composer Steve Reich (I mistakenly remembered this as Wilson's: think is was BAM, 1993); Lee Breuer's astonishing 1982 The Gospel at Colonus; Ruth Maleczech as Lear in 1990 (also directed by Breuer). I ran into Lee Breuer the week after I talked my editor into Grave. He and I talked for a few minutes in the street. And it was then that I realized that his performances, and the others I've mentioned here, were formative in my conceptualizing the project, which I originally thunk up when I was in college. Spalding Gray, in the auspice of my family, encouraged me in the idea at a Thanksgiving lunch when I was a college Junior, and, I am certain, highly irritating. He encouraged me again, years later, shortly after the publication of my second novel, Snowball's Chance. The Wooster Group, of which Gray was a part, came out of the same downtown as Lee Breuer's Mabou Mines. Also encouraging to me, and from the Wooster group, was Nancy Reilly, who first talked to me about Richard Foreman's "anitidote antidote." Shortly before the publication of Grave, Foreman informed me: "Americans can't do Shakespeare." Graciously, he blurbed my book anyway. David Byrne & Brian Eno: "Poor Boy"
Hold up his picture, wave—he’s your joy. with the mist of her breath on the window. and her wan eyes are punctured by sinkholes. and hops the first copter back to the city. and can pluck a rare bloom from the rubble. poor boys like me are easy to flatter. Another tenuous connection: I've seen quite a bit of Shakespeare in performance in the last year, and have a vision for staging Grave. Very minimalist. A bit of a modern update on the architect Richard Gluckman. In Act 1 & 2: a bed. In Act 3 & 4: the bed becomes a table. In Act 5, the table is removed, to reveal: a grave. When I was a teenager, Gluckman's wife, Tiffany Bell, put me in touch with David Byrne to audition for Storytelling Giant. I got cast, but messed up the actual performing. I think I've seen the tape, and I know I'm on it, briefly, but I've somehow blocked it out. Still, I learned quite a bit from Byrne—about life, I believe—just watching him on set. I was awestruck; in the artworld circles I was growing up in, his RISD pedigree made him a folk hero. Art of Noise: "A Time To Fear"
I'm not sure what to say about this one, except that it was somehow formative to Grave—all the found sounds and reintegration—and thinking about the experimental mode of music and theater as having broader applications. Blondie: "Fade Away and Radiate"
Similar to above. Also, that mash-up on YouTube: The Doors "Riders on the Storm" and "Rapture." Frightened my editor with that. David Bowie: "DJ," and "TVC15"
I keep thinking David Bowie would make the perfect Lear. The whole album, 30 Year Low, is roiling and fierce, and it's one of the few things I listened to when working on drafting the project.